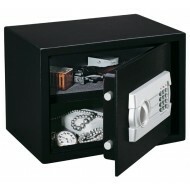 This Stack-On large strong box safe provides secure storage for valuables and important papers. 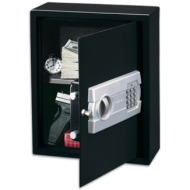 You can also keep your pistol out of the wrong hands with a safe like this with CA DOJ rating for secure storage of firearms. Use it to secure your pistol near your bed. It comes ready to be bolted to a wall or floor. The electronic key pad lock allows for fast access with your personal code. Make your personal code (password) as simple or complicated as you wish. A family member can have their own code also. Codes can be changed at any time and the safe can always be accessed with the over-ride key.